When planning a trip, there are many factors to consider. One of the most important items for many travellers is the weather. Certain destinations can be brilliant in winter and unpleasant in summer. Others are overly busy in the autumn months, but are a perfect, secluded getaway in the springtime. These factors depend on various elements, but one aspect remains of utmost importance: the weather.If you’re deciding when to book your Whitsunday yacht charter, you may be researching our local climate and expected weather. It’s important to know how to pack for your trip, but also to choose the time of year that suits you. To help you make your decision, we’ve put together this quick guide to summarise the weather in the Whitsundays. But whenever you come, we know you’ll love it here. The Whitsundays are one of those places which is fortunate enough to enjoy mild year-round temperatures, hovering around 27.4°C or 81°F. We have a sub tropical climate to thank for that! The summer season is a major period for travel and it’s a time which is definitely popular in the Whitsunday Islands. During the months of November through January (summer in Australia), temperatures often reach 31°C (88°F). The weather is typically bright and summery, and fits the perfect conditions for a tropical getaway. It can also be fairly humid at this time, and though rain showers may occasionally arise, they never last long. As Autumn approaches in February, and continues through March and April, conditions become a bit wetter. This is the “wet” season in Queensland, and though most days are sunny and humid, some rains will pop up during the days. Temperatures do not fluctuate much from the summer season, but move just a few degrees slightly cooler. Winter in the Whitsundays is heralded as one of the best times of year to visit the islands. The rainy season is over and the temperatures a bit more mild. Vibrant sun greets you nearly each day and cooler evenings keep you cosy while you sleep. What a wonderful time to cruise the Whitsundays! Of course, the stunning weather makes this a popular time for guests, so you’ll want to book early to secure your vessel. Temperatures in the winter months stay around 24-25°C (75°F). 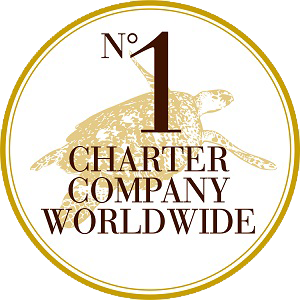 Should You Take a Guided Charter?